University of Illinois researchers developed a gel laden with gold nanoparticles that changes color when it reacts with a teardrop containing ascorbic acid, released from a wound to the eye. In a new study published in the journal Biosensors and Bioelectronics, the researchers used the sensor, called OjoGel, to measure ascorbic acid levels in artificial tears and in clinical samples of fluid from patients' eyes. "We expect a significant potential impact of this biosensor for evaluating the eye in post-surgical patients as well as trauma patients," said study leader Dipanjan Pan, a University of Illinois professor of bioengineering and the Carle Illinois College of Medicine. Pan's group collaborated with Dr. Leanne Labriola, an ophthalmologist at Carle Foundation Hospital in Urbana, to develop OjoGel. "OjoGel technology may allow for faster identification of serious eye injuries," Labriola said. "With a rapid point-of-care device such as this, anyone in an emergency department could perform a test and know within minutes if the patient needs urgent surgery to save their vision." Previous work by the group found that ascorbic acid concentration in tears is a good measure for determining extent of injury to the eye. Ascorbic acid, also known as vitamin C, is found in high concentrations in the fluid inside the eye, called aqueous humor, but normally has very low concentration in tears. "Deep damage to the cornea from trauma or incisional surgery releases aqueous humor into the tear film, which increases the concentration of ascorbic acid in tears to a measurably higher level than that found in normal eyes," said Pan, also affiliated with the Beckman Institute for Advanced Science and Technology at Illinois. "OjoGel offers a unique biosensing technique that provides an effective and simple method for testing ascorbic acid in a point-of-care delivery system." A tiny teardrop is all that's needed to cause a color-change reaction in the OjoGel. The extent of the color change correlates to the concentration of ascorbic acid in the tear sample, shifting from pale yellow to a dark reddish-brown as the concentration increases. The researchers did extensive testing to determine the concentrations associated with each degree of color change. They developed a color key and guidelines for using a mobile phone app, Pixel Picker, to precisely measure the concentration indicated by a reacted gel sample. Next, the researchers plan to continue refining OjoGel technology in hopes of producing a low-cost, easy-to-use clinical device. They also will perform clinical studies to determine whether OjoGel readings reliably evaluate eye damage. "In addition to continuing to develop the technology, in the next year we will be working to help health care providers understand the value this new device may bring to their practice over the current methods they use for evaluation," Labriola said. The National Science Foundation, the American Heart Association and Carle Foundation Hospital supported this work. 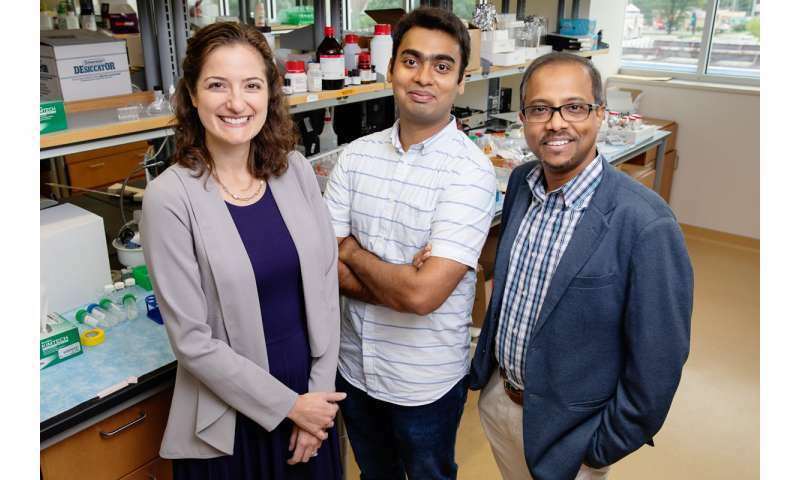 Postdoctoral researcher Santosh Misra, visiting scholar Ketan Dighe, graduate student Aaron Schwartz-Duval and summer scholar Zaixi Shang also contributed to the study.